Buln Buln Shire (1878-1994) was proclaimed in 1878. Its original size was considerably reduced by the creation of Warragul Shire in 1881 in the east and the creation of Korumburra Shire in 1891 in the south. In 1892 and 1893, a south-western portion was annexed by Cranbourne Shire. Buln Buln is the name of the survey County, and it is thought that the name derived from an Aboriginal expression describing the lyrebird or place of the lyrebird. Drouin, 92 km south-east of Melbourne, was the administrative centre. The shire covered 1259 square km. It was about 60 km from north to south, about 15 km wide in the southern half, and about 30 km wide in the northern half where it extended into the Great Dividing Range. The shire had small towns at Longwarry, Neerim South and Noojee and over a dozen farming districts. Farm settlements began in the mid-1870s, at first along the access track now followed by the Old Sale Road through Brandy Creek. The railway route ran to the south of the track, and the Drouin Junction town formed at the railway in 1878. Timber harvesting was followed by mixed farming, then dairy farming. 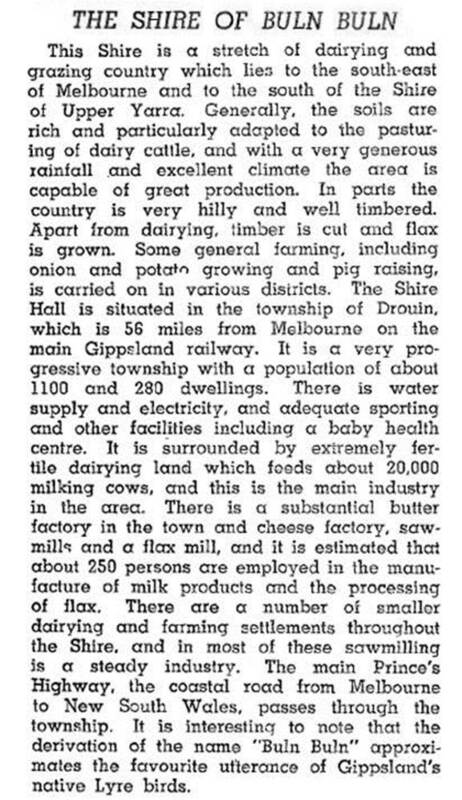 There were dairy factories at Neerim South (1903), Drouin (1904), Longwarry and at towns just outside the shire. Development of the northern hill districts followed a railway from Warragul to Rokeby (1890), to Neerim South (1892), to Nayook (1917) and to Noojee (1919). The greater part of the former shire was cleared farmland, ranging from undulating to hilly. The soil was fertile, and dairy farming and grazing were the main activities. In the northern forested part of the shire, timber extraction and sawmilling were carried on. The Tarago Reservoir, completed in 1969, provided water for the Mornington Peninsula. In 1994, the shire was amalgamated with Warragul Shire and most of Narracan Shire to form Baw Baw Shire. Drouin's proportion of the shire's population was 35% in 1911 and 38% in 1991.